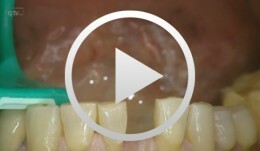 Contents: When treating recurrent periodontitis surgically, the challenge is to sacrifice as little soft tissue as possible in esthetically critical areas. This surgical case demonstrates the technique used in patients with narrow approximal spaces. Objectives: To report a case of a severe horizontal defect in a maxillary lateral incisor in which GBR was applied with adjunctive use of autologous (mandibular body cortical) bone and xenogeneic bone graft (BioOss[TM]), combined with titanium mesh, to improve clinical and aesthetic effectiveness, with a two-year follow-up. Methods: A 30-year-old non-smoking female patient with an uneventful medical history was referred to the Implantology Clinic at Paulista University, São Paulo, with a compromised maxillary lateral incisor, and complaining of masticatory parafunction and aesthetic issues. Despite satisfactory oral hygiene, intraoral examination showed advanced local tissue destruction with severe alveolar bone loss and dental mobility.  A large buccal plate dehiscence was detected clinically and radiographically. A non-traumatic surgical approach under local anaesthesia consisted of simple manual tooth removal, requiring no forceps or elevators. After 30 days of healing, a cone beam CT showed lingual bone width of 3mm. An implant (3.25 x 13mm Biomet-3i) was installed in the basal bone adjunctively with a mixture of particulate autologous bone graft harvested from mandibular body cortical bone and BioOss[tm] xenogeneic bone graft (to reconstruct the horizontal defect). A preadapted titanium mesh (Neobiotech[TM]) and resorbable collagen barrier (BioGide[TM]) were placed over the grafted region to help maintain bone volume and prevent any exposures. 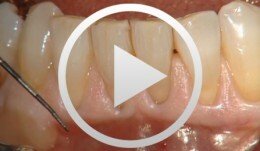 During a six-month healing period, the patient used a provisional removable partial denture. Then the titanium mesh was removed and a provisional crown was fabricated to optimise the emergence profile. Results: No bone exposure was observed in the grafted area and no complications occurred in the donor site. Postoperative clinical and CT examinations at 6, 12 and 24 months showed sufficient and satisfactory bone formation. 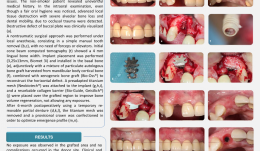 Besides the limited torque (15N/cm) during implant placement, the final prosthetic design was successful. At two-year follow-up, volumetric stability and satisfactory functional and aesthetic results were achieved. Conclusion: Mixed bone grafts combined with titanium mesh appear to be an effective and advantageous procedure for horizontal bone defects in aesthetic zones, providing volumetric stability and satisfactory functional and aesthetic results.